Global Indians for Bharat Vikas (GIBV), USA coordinator for Metro Washington, DC, Dr. Anju Preet appeals all to vote for Narendra Modiji. Please share. — at Us Capitol – Washington Dc. 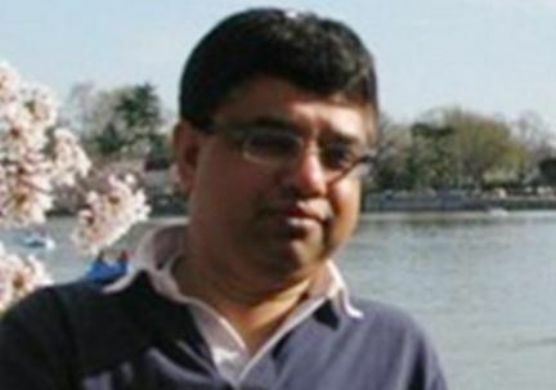 Almost two and a half years back Dr. Divyendu Sinha, a computer scientist was attacked by five teenagers when he was out for an evening stroll with his family in Old Bridge, New Jersey. While his two sons were injured, Divyendu Sinha died due to head injuries after four days. Volunteers of Vishwa Hindu Parishad (World Hindu Council) of America (VHPA) have been with the family from day one and are monitoring the cases as they move through the legal system. There have been inordinate delays in prosecuting the case and the trial of the first defendant, Steven Contreras, driver of the car resulted in acquittal on most serious charge of first degree murder. On one charge that was not resolved by the jury, he was able to obtain a slap on the wrist by pleading guilty to reckless aggravated assault where he would not receive more than four years of prison time. No trial date has been set for the remaining four defendants and we are concerned that they would be offered a lenient plea deal as well to avoid a trial. Even if the case goes to trial it will take months as for one or the other reason, this case is relegated to a back seat. (Please see the background of this case below.) Therefore, we need your help now to put enough pressure on the Prosecutor so that he may not bargain away Sinha family’s rights to fair justice through a speedy trial and punishment of the guilty to fit the crime. <http://www.change.org/petitions/mr-bruce-kaplan-prosecutor-middlesex-county-nj-we-want-justice-for-the-murder-of-dr-divyendu-sinha> then on the right side where it says Sign this petition, fill out necessary information and click Sign. Please circulate this email widely to your contacts and mail groups in USA and all over the world. We cannot bring back Divyendu Sinha but together, through thousands of signature we can compel the prosecutor to strive to get maximum sentence to the perpetrators of this crime. his injuries four days later.After beating Dr. Sinha, the four teenagers ran back to the car and fled. They bragged to each other about what they had done and how much they enjoyed it. Julian Daley, 16, Christian Tinli, 18, Christopher Conway, 17, Cash Johnson, 17, along with the driver of the car, Steven Contreras, 17, were charged with murder and other lesser counts. Earlier this year, on May 8th, 2012, in a verdict that devastated many, including the Sinha family, a jury found the driver of the get-away car, Steven Contreras, Not Guilty of murder, and could not reach a verdict on the count of reckless manslaughter, for which he could be re-tried. Subsequently, he pleaded Guilty to conspiracy to commit aggravated assault, and faces up to four years in prison, in a plea bargain with the Prosecutor’s Office. It has been two and a half years since the murder of Dr. Sinha, and no trial date has been set for the remaining four defendants. We must demand that the trial begin in short order without further delay. The murder of Dr. Sinha was a heinous crime perpetrated on a good man, a good family man, a good citizen. He graduated from the Indian Institute of Technology in 1982, authored a number of technical papers in computer science. After teaching stints at Stevens Institute of Technology and at the College of Staten Island, he worked at Siemens, an international electronics and engineering company. His students, business associates, friends and family, have nothing but kind words to describe him, and are devastated by his murder. We must demand that the remaining four defendants be tried for 1st degree murder, convicted and sentenced to life in State prison. Nothing will bring Dr. Sinha back to us, but we must ensure that justice is served on his killers. Old Bridge, NJ is a suburban town of roughly 66,000, and rarely encounters violent crime. This murder has shaken the town, and its residents are awaiting justice in order to restore their safety and security.